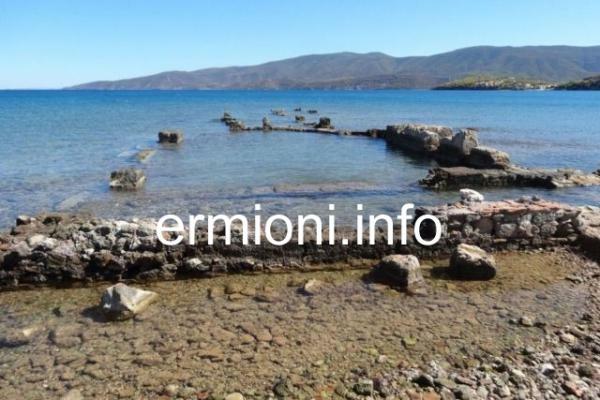 The ancient site at Isthmia was a religious sanctuary dedicated to the sea-god Poseidon, and along with Olympia, Delphi and Nemea, Isthmia made up the four Panhellenic sites revered by all Greeks. The Isthmian Games took place every two years, with drama and poetry competitions taking place alongside the normal athletic contests, and drew many famous visitors including Alexander the Great, Paul the Apostle and the Emperor Nero. The founding date of the Isthmian Games is 584 BC with the athletic and religious festivals being second in importance only to Olympia, which held its games every four years. Contestants from all over Greece travelled to the sanctuary to participate, due to Isthmia's important geographic location, which continued into the Middle Ages when Isthmia also became the main bastion in the Byzantine defences of the Peloponnese (Medieval Morea). The Isthmian sanctuary was established near the ancient road between Athens and Corinth, the two largest and wealthiest city-states in ancient Greece. 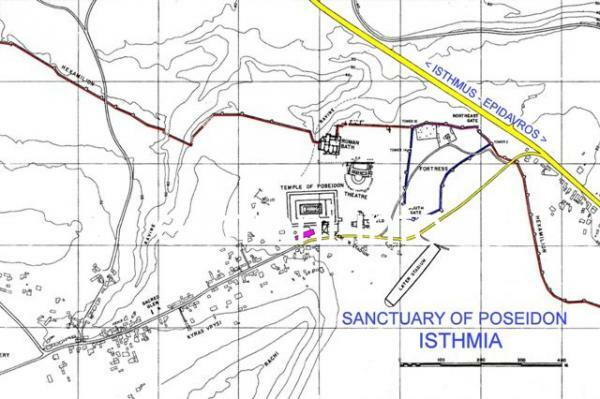 Isthmia would have attracted many travellers and merchants, as well as sea traders calling in to the ancient port of Kenchreae, less than 4 kms away from the sacred sanctuary. 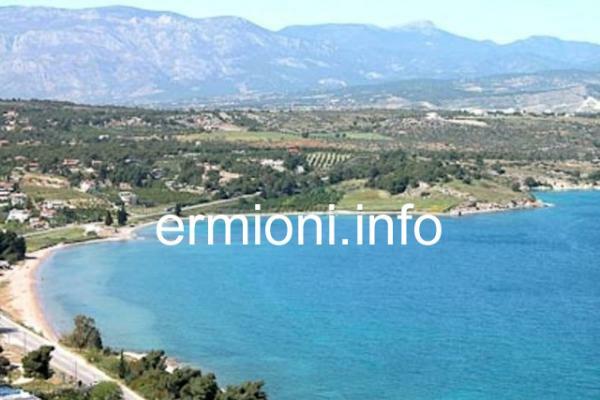 Isthmia was only 1km away from the ancient Diolkos stone track, where ships were hauled overland between the Corinthian Gulf to the West and the Saronic Gulf to the East, over two thousand years before the construction of the Corinth Canal. The original archaic temple to Poseidon was constructed at Isthmia during the 7th Century BC. Just after the period of the second Persian invasion of 480 BC, this temple was destroyed by fire and a new larger temple was built, allowing the Isthmian games to continue. These games continued uninterrupted, apart from 390 BC when a large Spartan army marched on the Isthmus. Since the Isthmus was the crossroads of Greece, armies would continue to march through it, often with disasterous consequences to Isthmia and the temple. After many years of Macedonian and Roman rule, Christianity eventually became the only legal religion in the Empire and the games given in honour of Poseidon ended. By 400 AD the sanctuary was abandoned, and during the reign of Emperor Theodosius II the Hexamilion fortified wall was built across the Isthmus. The construction of this Hexamilion, six-Roman-miles (7.7 kms) of defensive wall required a huge quantity of building material, so many abandoned buildings within the sanctuary, including the temple, were torn down to their foundations and plundered for their stone and marble. 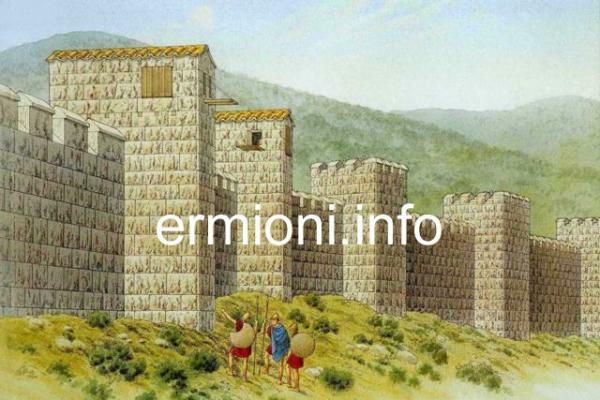 The massive Hexamilion fortifications built along the Isthmus were designed to protect the Peloponnese from all invasions from the North by Barbarians, and included a fortress and 153 towers along its entire length. This fortress at Isthmia became the 'gateway' to the whole of Southern Greece (Medieval Morea) and throughout its history the Isthmia fortress was occupied by various invading armies including the Byzantines, Franks, Venetians and Ottoman Turks, remaining in use until the 16th Century. 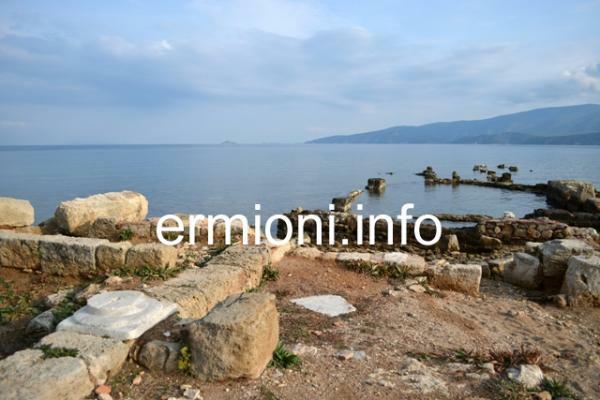 The Hexamilion wall is the largest archaeological structure in the whole of Greece, with certain sections that can be seen and explored today, located near the Isthmia Archaeological Museum. 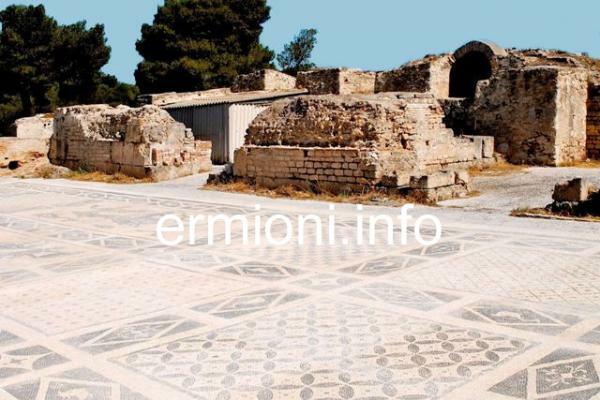 Isthmia Archaeological Museum is located near to Kyras Vrysi, 600 metres from the main Epidavros-Isthmus road, situated opposite the Old National road and the New National road junctions leading to Athens. The museum opened in 1978 and contains archaeological finds from the sanctuary and from excavations in the Isthmia area, including the ancient harbour of Kenchreae. The museum has one single open area on the ground floor that displays all the archeological discoveries. Some of the important exhibits on display include a marble basin supported by 4 female Korai statues, a bronze Scythian type helmet, a statue of Roman Amphitrite, a marble head of an athlete, opus sectile panels and decorative ivory plaques. The construction of the museum and the maintenance of the central sanctuary has been the responsibility of the University of Chicago, while the Ohio State University have worked on the Roman Bath with the large floor mosaic (pictured above) and the East Field, in addition to the surrounding areas of the ancient and medieval site. The Hexamilion fortress walls and tower bastions near to the South Gate can be seen before you arrive at the museum. The Museum is open daily 08:00 to 15:00 - Closed on Mondays and public holidays. Admission: 2 Euros. Isthmia Sanctuary is located next to the museum. The sanctuary was discovered in 1952 by Professor Oscar Broneer, from the American school of Classical Studies, and the archaeological excavations have been carried out nearly continuously since then. Most of the sanctuary has been stripped of its original architecture and used in the construction of the later Hexamilion fortifications. 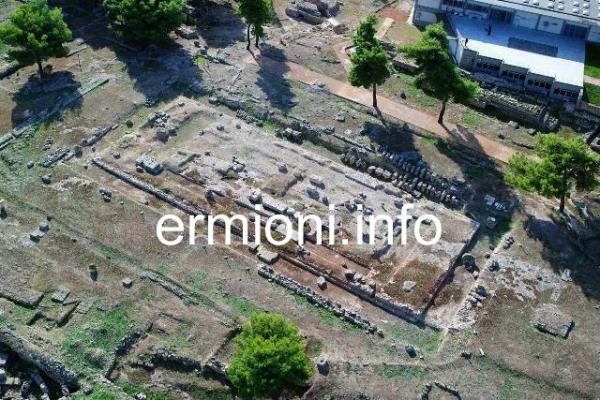 Isthmia was an important athletic centre, but so far only the stadium has been excavated, the athletic buildings that existed remain unexplored. The large temple of Poseidon is located immediately behind the museum, with the East field, theatre, Greek pool, Roman bath and the earlier stadium adjacent to the temple. The original stadium was 192 metres in length and had 16 lanes. The larger Hellenistic stadium is located across the road, opposite the South gate of the Hexamilion fortress. The original theatre was constructed around 400 BC and was renovated many times during the Classical, Hellenistic and Roman periods. The Roman bath, located by the Hexamilion wall, was constructed in the mid-2nd Century with its mosaic floor covering the original Greek pool. This wonderful Italian-style monochrome mosaic floor, has now become the main focal point of the Isthmia sanctuary. Hexamilion is the name of the fortified wall that stretched for six Roman miles (7,728 metres) across the Isthmus, from the Saronic Gulf to the Gulf of Corinth. The Hexamilion was the last in a long line of attempts to fortify the Peloponnese from the rest of Central Greece, where most land invasions and military raids originated from. From its humble beginings in the Mycenaean period, and its well documented accounts during the Persian invasion of 480 BC, where the Southern Greek city-states were keen to defend their homeland at the Isthmian wall, instead of marching North to defend Thermopylae as the Spartan King Leonidas had done, with the issue repeating itself again before the naval Battle of Salamis. The wall was further developed by the Macedonians, but what we see today was from the Roman-Byzantine period, when the Hexamilion wall was constructed between 408-450 AD using most of the stone from the ancient sanctuary and temple of Poseidon. The Hexamilion was a response to the Barbarian raids on the Roman Empire, who invaded Greece in 396 AD, sacking the sanctuary. The wall included towers, sea bastions and a fortress next to the sanctuary, which incorporated a monumental arch giving a grand entrance to the Peloponnese. Kenchreae (Cenchreai) was the Eastern port of ancient Corinth, just 10 kms from the city, and was the main trading route to Athens and Asia Minor throughout antiquity. 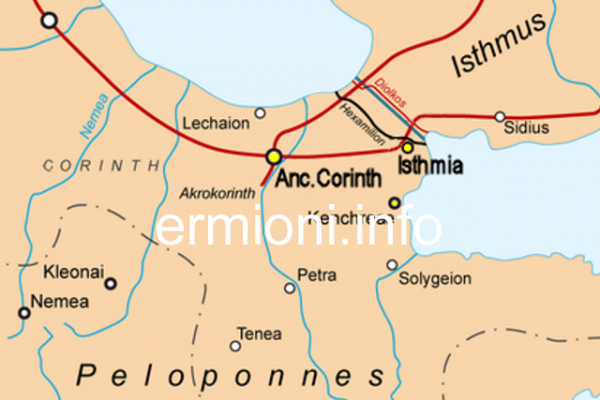 The Northern port of ancient Corinth was Lechaieon, with Western trade routes to Italy and the rest of Europe. Kenchreae was a large ancient port with a deep water harbour, and included the temple of Isis and Sanctuary of Aphrodite, both protectors of seafarers. Kenchreae became one of the earliest Christian centres of worship, with one of the first churches being built near to the port, showing that trade helped the spread of Christianity. Paul the Apostle set sail for Jerusalem from this port after completing his second mission in Corinth, but first having his hair cut at Kenchreae to fulfil a previous vow. 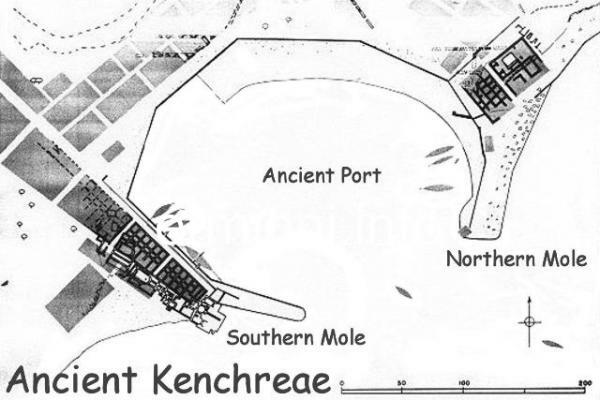 The ancient port of Kenchreae was partly excavated by the American school of Classical Studies during the 1960's, with excavations relating to the period of the Roman Empire, right up to the 7th Century when maritime activity apparently diminished. 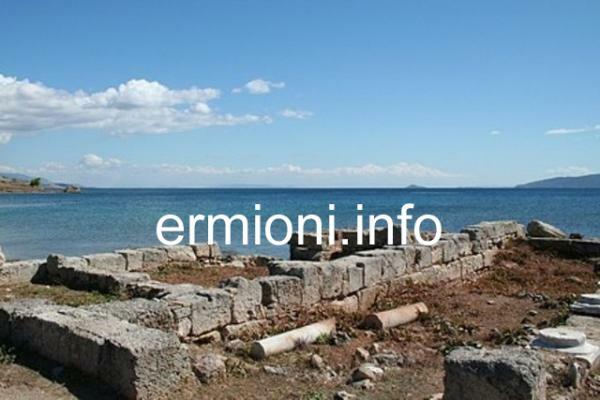 Archaeological discoveries from the port area are now at the Isthmia Archaeological Museum. Amongst the many finds, the most important was over 100 opus sectile (stained glass) type mosaic panels found in their original packing crates, awaiting installation. 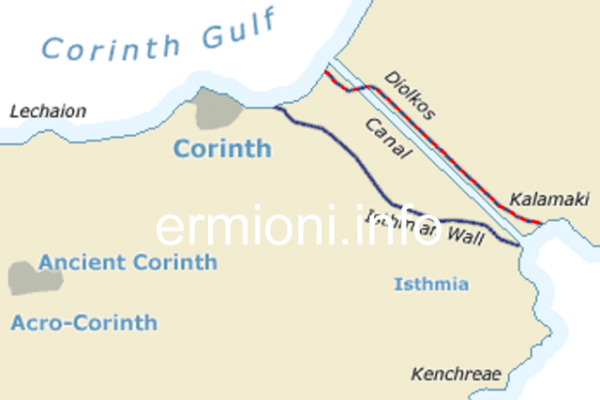 Diolkos was a 7.5 km paved limestone track, with parallel grooves, that enabled boats to be moved overland across the Isthmus of Corinth. Located just 1 km North of Isthmia, running alongside the present Corinth Canal, it allowed ancient vessels to avoid the long and dangerous circumnavigation of the Peloponnese peninsula. As well as transporting small trading boats, Spartan, Macedonian and Roman warships used this overland route to speed up naval military campaigns. The Diolkos operated between the 7th Century BC and mid-1st Century AD and was put out of operation by Emperor Nero's abortive canal works in 67 AD when his workers sliced through its Western end. Previously hidden parts of the Diolkos were uncovered by accident during the construction of the Corinth Canal at the end of the 19th Century. 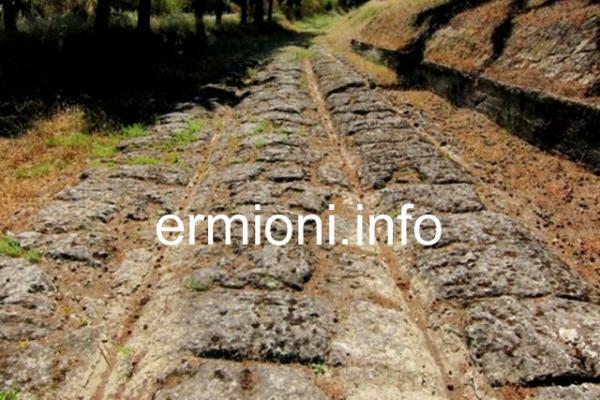 The Greek Archaeological Society carried out controlled excavations in the late 1950's to determain the actual route of the paved track. It was during these excavations that the greater part of the Diolkos was uncovered and confirmed that it ran from the Gulf of Corinth all the way to the Saronic Gulf. Sadly, as these new discoveries were left exposed to the elements, many sections are now in a very poor state due to erosion, particularly at its Western section.